IT’S GOOD IT’S GOOD FOR YOU! Damdalicious will be available online! 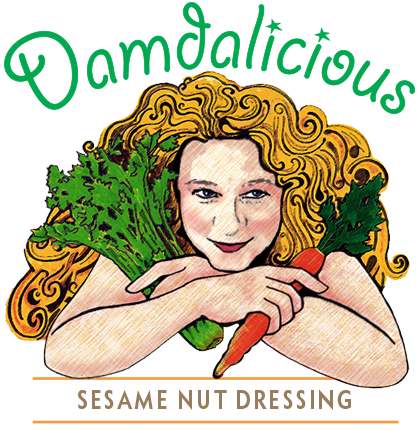 Created as an alternative to the highly acidic, vinegar based dressings, Damdalicious is also made with organic ingredients and is GMO free. Lowers cholesterol, reduces cardiovascular risks, lowers blood pressure. Reduced risks for strokes, breast cancer, coronary artery disease, skin diseases and type-2 diabetes. Reduced risks for heart attacks, diabetes and artery damage. Good for brain function, healthy fats that aid in weight loss, strong teeth and bones, gastrointestinal health and help alkalize the body. Reduced risks for diabetes, high blood pressure and some cancers. Good source of protein and beneficial for oral health, high blood pressure, arthritis, asthma and constipation. An anti-inflammatory that also relieves gastrointestinal problems and has been shown to aid in treatment of Alzheimer’s disease, arthritis, skin diseases and muscle cramps. Also known to help as a memory booster. A natural antibiotic that also assists in weight control, cancer prevention, viral diseases and the prevention of heart attacks and strokes. Aids in the treatment of anemia, indigestion, flatulence, constipation, diarrhea, colic, menstrual and respiratory disorders. It helps protect the liver and aids in lowering blood pressure in the case of hypertension. A natural anti-oxidant that that assists with digestion, constipation and flatulence. It’s also good for the skin, asthma and it breaks down fat cells, which aids in weight loss.